Tolerating a very narrow range of environmental conditions including temperature, salinity, and solar radiation, reefs are very sensitive to damage from environmental changes. Corals, in particular, are susceptible to a number of diseases including black band disease, white band disease, and coral bleaching. Black band disease was first described in the early 1970s as a black band moving on the surface of star corals (Monstastrea spp.) and brain corals (Diploria spp.). It destroys live tissue as it moves over the surface of the colonies, leaving behind bare white skeleton. This disease may kill entire colonies within a matter of a few months, however tissue loss from a colony can be only partial with recovery after the black band disappears. This black band consists primarily of the filamentous cyanobacterium Phormidium corallyticum along with other microorganisms. Research has shown that the death of coral tissue is caused by lack of oxygen as well as exposure to hydrogen sulfide in the tissue adjacent to this black bacterial band. Black band disease occurs when corals are stressed by environmental factors including sedimentation, nutrient levels, pollution, and high water temperatures. These stressors primarily exist during the summer months in the Florida Keys. 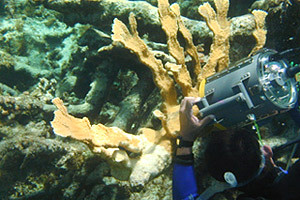 Black band disease has been observed throughout the world’s reef systems with recent outbreaks in the Caribbean and the Florida Keys. White band disease was discovered when biologists observed the peeling of tissue from colonies of elkhorn and staghorn (Acropora spp.) corals in waters of the U.S. Virgin Islands. This tissue loss resulted in a distinct line of bare white skeleton, after which this disease is named. Although scientists are unsure about the cause of this disease, it is suspected that algal overgrowth of the coral maybe the primary cause. White band disease progresses from the base of the colony up towards the tips of the branches. Bare, white coral skeleton is left behind, colonized by filamentous algae. 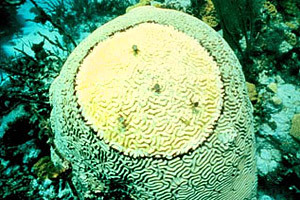 White band disease has had a devastating impact on the corals in the Caribbean, with the infection of approximately half of the shallow water elkhorn corals within the first five years after this disease was first observed. White band disease also devastated reefs in the Florida Keys, killing 95% of all Acropora corals. 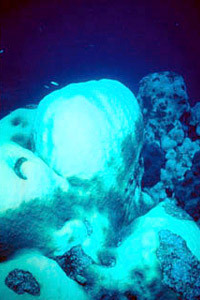 Even today, the presence of this disease is still evident on many reefs throughout the Caribbean. Coral bleaching occurs through the loss of the symbiotic algae found in living coral tissue. These zooxanthellae are responsible for giving healthy coral a brownish or greenish coloration. When these algae are lost, the white coloration of the underlying skeleton is visible through the translucent coral tissue. 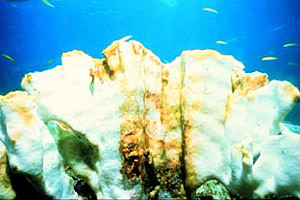 Partial bleaching may occur, resulting in only partial loss of zooxanthellae from the colony, as well as total bleaching when the entire coral colony appears bleach white. This coral disease was first reported in the late 1800’s, however since 1980 extensive outbreaks affecting numerous species have been documented. 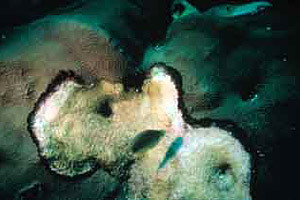 The affects of bleaching vary greatly among species of corals as well as between individuals within the same species. Bleaching is believed to be a response to stressful environmental conditions. It is attributed to increases in ultraviolet radiation, extreme temperatures and salinities, and high levels of turbidity and sedimentation. Loss of zooxanthellae affects growth rates and overall health of the coral host. zoanthid: generally small anemone; may be colonial or solitary, and both symbiotic and free-living.